Box Text: THE CONSPIRACY IS NO LONGER A THEORY. 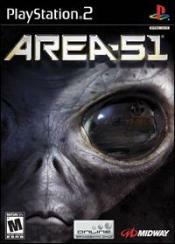 DISCOVER THE MIND-BLOWING TRUTH ABOUT UFO'S, ROSWELL, ALIEN AUTOPSIES AND ORE AS YOU BLAST YOUR WAY THROUHG THE U.S. GOVERNMENT'S MOST SECRET AND SECURE MILITARY FACILITY: AREA 51. UNLEASH DESTRUCTION WITH FEARSOME HUMAN AND ALIEN WEAPONRY. BATTLE AN ENEMY UNLIKE ANYTHING YOU'VE EVER FACE. BIOLOGICAL MUTATIONS GIVE YOU ALIEN-ENHANCED PHYSICAL ABILITIES. INTENSE MULTI-PLAYER TEAM BATTLES: 2 PLAYER SPLIT-SCREEN OR MULTI-PLAYER ONLINE WITH UP TO 16 PLAYERS. FEATURING THE VOICES OF DAVID DUCHOVNY, POWERS BOOTHE AND MARILYN MANSON. 07-21-2017 shepard11 Box Text THE CONSPIRACY IS NO LONGER A THEORY. 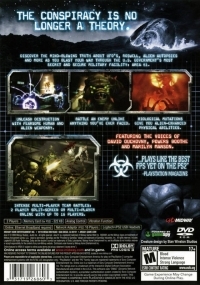 DISCOVER THE MIND-BLOWING TRUTH ABOUT UFO'S, ROSWELL, ALIEN AUTOPSIES AND ORE AS YOU BLAST YOUR WAY THROUHG THE U.S. GOVERNMENT'S MOST SECRET AND SECURE MILITARY FACILITY: AREA 51. UNLEASH DESTRUCTION WITH FEARSOME HUMAN AND ALIEN WEAPONRY. BATTLE AN ENEMY UNLIKE ANYTHING YOU'VE EVER FACE. BIOLOGICAL MUTATIONS GIVE YOU ALIEN-ENHANCED PHYSICAL ABILITIES. INTENSE MULTI-PLAYER TEAM BATTLES: 2 PLAYER SPLIT-SCREEN OR MULTI-PLAYER ONLINE WITH UP TO 16 PLAYERS. FEATURING THE VOICES OF DAVID DUCHOVNY, POWERS BOOTHE AND MARILYN MANSON.